Some fleet customers choose to buy new AutoGas vehicles, but many of our fleet customers choose to convert their existing fleet vehicles from gasoline to propane AutoGas. 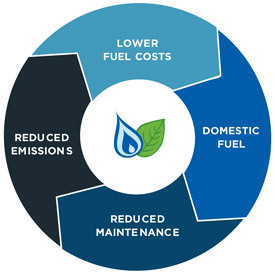 In partnership with Alliance AutoGas, Sharp Energy uses an aftermarket conversion system from global technology leader, Alliance Engineered Fuel System, which is EPA-certified for more than 200 vehicle types. The competitively priced Alliance Engineered Fuel System powers millions of AutoGas vehicles worldwide. Working with fleets of all sizes, Sharp Energy and Alliance AutoGas are helping fleets save significantly on fuel costs and displace enormous amounts of gasoline. When you convert your fleet to run on propane AutoGas with Sharp Energy, you are investing in your fleet’s future. Our conversion system can be moved from one fleet vehicle to another provided it’s the same engine platform. Replacement vehicles can immediately be converted with minimal investment, and your fuel cost savings can be passed to a new generation of vehicles. Your partnership with Sharp Energy includes Certified Conversion Centers with trained technicians who will convert and maintain your AutoGas vehicles. Sharp Energy certified conversion technicians deliver quality-controlled, EPA-certified conversions. If you have a larger fleet with skilled in-house technicians, our conversion experts can train your fleet mechanical team to perform conversions and maintenance for your AutoGas vehicles. We also will train your service center. Reducer: Converts the liquid AutoGas to vapor. Injector: Injects the AutoGas into the manifold. Filter Units: Filters particles out of the fuel. Computer: Controls the whole system. LPG Switch: Displays fuel level and allows driver control over fuel. With the bi-fuel system, the vehicle starts on gasoline and immediately switches to AutoGas. This technology provides drivers with flexibility and fleet managers with peace of mind and alleviates range anxiety. The vehicle can switch back to gasoline if necessary, so fuel can always be reached. For fleets interested in vehicles that operate exclusively on propane AutoGas, we also offer the AutoGas-dedicated Alliance Engineered Fuel Systems. For some fleets, the mono-fuel liquid system is a better fit and ensures maximum fuel cost savings. However, the technology alone isn’t enough. Add our AA+ rated warranty, the ability to transfer conversion systems to new vehicles, and exceptional customer service, and it’s clear why fleets appreciate our complete program. Vehicle conversion requires no upfront cost with Sharp Energy. Through competitive financing programs, Sharp Energy delivers AutoGas conversions for a low monthly payment that is typically more than offset by fuel cost savings. The total cost of vehicle conversion depends on the type of vehicle being converted (car, van or truck) and the number of vehicles in your fleet, but a gasoline to AutoGas conversion costs between $6,000 and $7,000 with potential for grants and tax incentives. Fleets that participate in the Sharp Energy financing program automatically experience an immediate return on investment (ROI), and those who pay for conversions upfront typically see a ROI in 12 to 24 months, depending on mileage driven. Sharp Energy offers two excellent financing options: one is custom designed for privately owned vehicle fleets, and the other is designed specifically for public fleets. Both financing options offer favorable terms that, in most cases, enable the fleet to offset their payment through fuel cost savings.